Get your hands in some tabletop mayhem! If you're a courteous player in the Seattle area who enjoys visually stunning Tabletop Minis gaming, drop me a line! July 18, 2016- We finished up a fun little Star Wars RPG campaign. Check out some glimpses of the action! A COUPLE MORE YEARS GO BY- Job change leaves Fabricator General missing in action. Report any sightings to your local Commisar. A COUPLE YEARS GO BY- A lot has happened at Ironhands.com, sorry for not keeping up with it all here! Made a bunch of new board games... check em out! February 19, 2012- Finally posting pics of some new models we're using in our Derelict games... an Imperial Fists Dreadnought, and some scratch built Necron Wraiths! 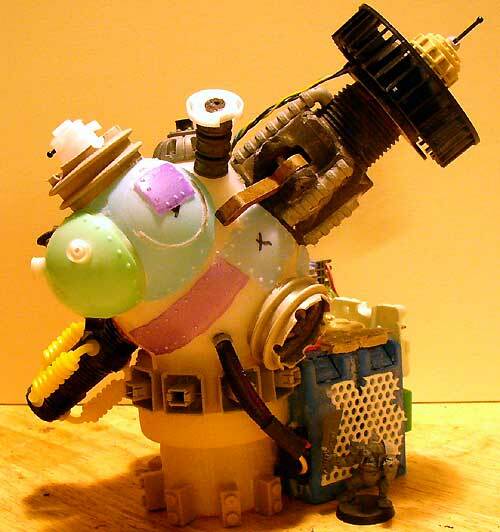 November 06, 2011- Now you can see all the diabolical little critters that have been running amok in Gobbledygook on the Gobbledygook Miniatures page! October 03, 2011- If you like the idea of a Harvest Festival gone horribly wrong, check out the new Gobbledygook terrain page! September 17, 2011- Made a new and terrifying Pirate Blood Galleon for Starcrashers. See it in action in the latest Starcrashers Scenario, Nebula of Blood. August, 2011- More campaign updates for our Votoms RPG- we now have two pages of campaign logs! June 19, 2011- Updated several pages with new terrain! Alternate version of the PLASMA TOWER... New multipurpose BLOCK SUPPORT pieces... And two beautiful new CORRIDOR SECTIONS for Space Hulks and such. Feb. 20, 1011- ROAD WOLF is still going strong, with new scenarios and vehicles coming in all the time. Check out these crazy MONSTER TRUCKS! Dec. - Jan. 2011- No, I haven't been idle... we've been playing DERELICT, my latest free tabletop game that puts a whole new spin on SPACE HULK. Play coop and solo games! Easier rules are great for kids! Nov. 24, 2010- Thanks to my new game GOBBLEDYGOOK, there's some cool new FOUNDATION pieces that make for even better MORDHEIM terrain! Oct. 09, 2010- Updated the ROAD WOLF models page with a few more cars for the Rodders and Survivalists. Sept. 19, 2010- Exploring new worlds of Terrain, here's my first take at TAU TERRAN! August 26, 2010- There's a new game in town: ROAD WOLF pits vehicles against each other in deadly duels on the open road! Check out the MODELING page too. August 11, 2010- There's now a whole new page for Mos Eisley terrain in the For Sale department. Get yours before the Hutts buy it all up! June 12, 2010- the MAIN PAGE has gotten a face lift, with some new categories- most notably a place for my Gundam terrain. May 26, 2010- Mos Eisley has gotten bigger! You will never find a more wretched hive of fun and vanilla-y! Now with 115% more Cantina. May 17- Yeah, we're still playing lots of MS ERA games, but that didn't stop me from making THIS cool new Imperial terrain piece. Enjoy! May 02- I had made a HABS building for someone that came out well, and am just now posting it. Enjoy! Also, look for some new Star Wars and Imperial terrain coming soon. April, 2010- Okay, now we're playing LOADS of my newest game, MS ERA. 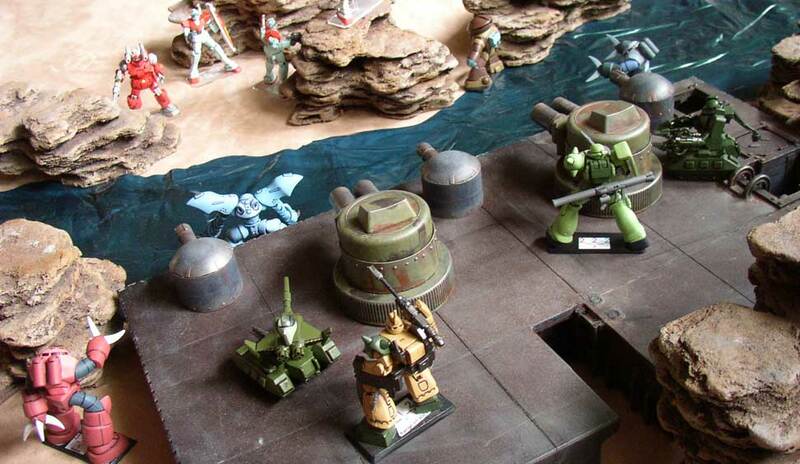 Mobile Suits from Gundam, battling it out on the table... Expect some Gundam specific terrain at some point! Feb. - March, 2010- We've been playing LOADS of STARCRASHERS, adding new ships and rules and stuff. Really. Jan 30, 2010- Check out these home brew SPACE SHIP MODELS, made just for STARCRASHERS, my latest game of space ship exploration and battles. It's a hit with friends and family alike! Dec. 05, 2009- More cultists, this time Khornate maniacs just in time for our latest chaos campaign scenario! Nov. 08, 2009- Check out the Ork Big Gunz! Also note that thhe Big Gunz, Ork Minelayer and the Imperial Gun Battery are now available for purchase. October 13, 2009- The end of our Gorka Morka campaign featured custom Fighta-Bomma and Minelaya vehicles, and the new Imperial Gun Battery! 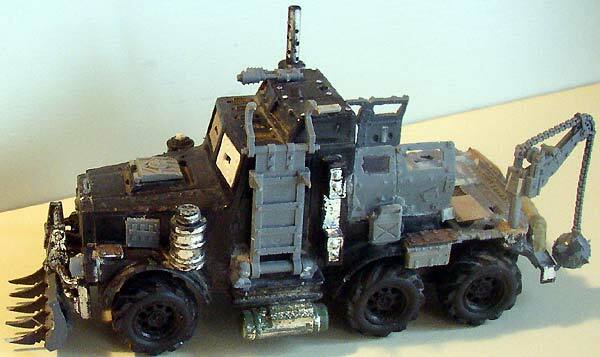 Sept. 04, 2009- As the Gorka Morka campaign wraps up, expect to see a few more vehicles like this Blood Axe Haff Trakk! August 22, 2009- The Ork Deff Ray, er, Tellyporta-- I mean, Force Field... Whatever it is, check it out! August 09, 2009- Yay, new photos of Star Wars Terrain in the Rebel Ship section! July 31, 2009- Added more pics of not one, but TWO ork forts combined for a spectacular game. Oh, and a new Ork tank of course. Clevva Orkz kan also see sneek peekz uf fings 'ere, so keep yer eyez on it, yer? July 25, 2009- Dere's more Goff minis n' vehicles. An' anuvver fing... itz dis TOP sekrit Orky Gubbinz in da werkz! Shhhh, don' let da grots heer! June 20, 2009- Added a whole page just about making rivets, 'cos they're that important. 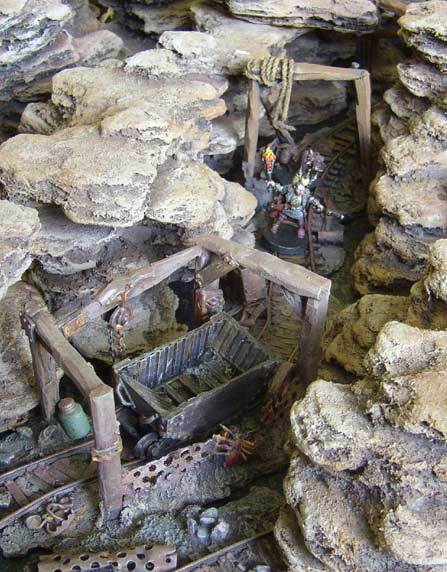 June 09, 2009- The GORKA MORKA ork terrain page has been updated with loads of new terrain! Check it out NOW! May-ish- A slow but steady stream of new models and vehicles are being added to the Ork Minis pages while you aren't looking. April 22, 2009- In preparation for our Gorka Morka campaign, I scanned in some older ork models, and COMPLETELY REORGANIZED the Ork Minis pages! April 13, 2009- Here's some cheekysneakpeeks of some stuff I've been working on for our upcoming Gorka Morka campaign. Coming soon: paint! 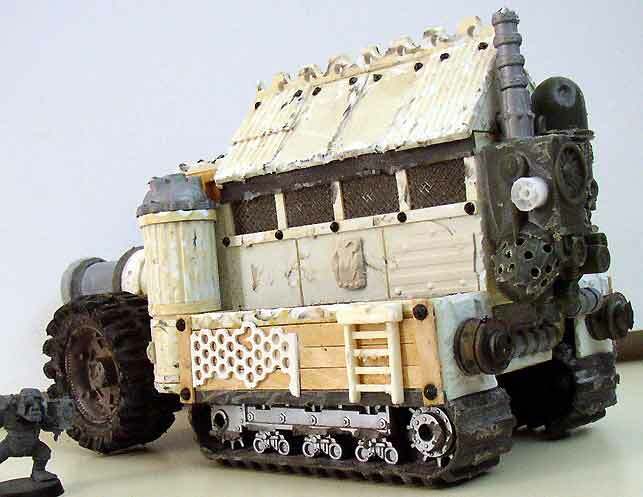 April 12, 2009- Added pics of a couple new Imperial Vehicles to the Sororitas and Arbites pages, in preparation for the close of our campaign. January 19, 2009- Added a sneak peek of some new Star Wars terrain inspired by the Rebel Blockade Runner. November 22, 2008- Added pics of some new train cars to the Imperial Train page. November 16, 2008- Added a quick picture of a new beastie for the Necrons, a reinterpretation of the Tomb Spider. 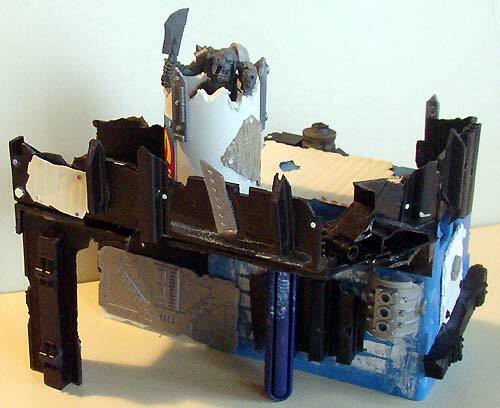 November 15, 2008- Check out this wrecked ship terrain piece, or see it in person at the grand opening of the Kent GW store! September 25, 2008- Added a page with LOADS of pics of the new foundations, rivers, bridges and stairs we've been enjoying in our 40K games. September 07, 2008- Added a new production terrain piece- the Shot Tower. It's got a light and everything. September 06, 2008- Picked up my copy of Assault on Black Reach- it's chock full of awesome. I wasn't too fond of the idea of helicopters though, so I made some alterations and came up with this suitably Orky alternative. I'll try to write up a conversion article later, it's very satisfying to make. August 15, 2008- I've started up Campaign gaming again, so expect to see some new terrain and minis rolling in over the next few months. Game ON! August-ish, 2008- Apologies for the site being down... Had to switch providers, hopefully the worst is behind us. Email might be a bit delayed, or missed altogether, so try hitting me again in a week or so and I'll get back to you. Thanks for your support! June 01, 2008- Yep, Endor Terrain. It came out pretty nice IMHOLOLWTF. Seriously though, I gotta get back to work now. May 04, 2008- The Star Wars madness continues. This installment: Hoth. Enjoy, and look for Endor terrain to come in a month or so! March 23, 2008- I wrote up the rules we've been using for our Star Wars Galactic Heroes games. It's good, clean fun, and easy to learn- give it a try! This is the first of (hopefully) many of my casual games I'll be adding to the site. Yes, that means Cattle Baron is coming, and Counter-Attack too if I can remember how to play it. February 09, 2008- I just got my copy of =DARK HERESY=, the first (and sadly the last) 40K RPG by Black Industries (the guys behind the award winning WHFRP game). It looks awesome. I weep with joy for the possibilities and sadness for the untimely misappropriation of the forces that put this work of art together. Quick, buy your copy today while you still can, and play many rich and glorious campaign games in memoriam. December 30, 2007- Finished a charming new Production terrain piece- check out the Pump House. October 08, 2007- Sigh, going to be a busy month, but look for the next STC article in November-ish. And until then, you can see thesepicsofit. I'm calling it the Promethium Plant, or something like that. Yeah. 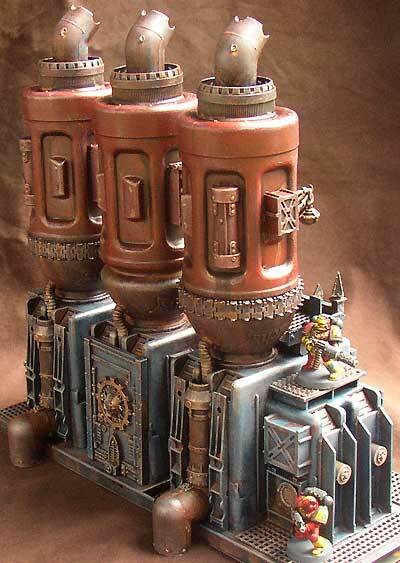 August 27, 2007- Finished a new production terrain piece- the new Type II Filtration Tower! You'll like it. It's big and neato. And if you really must have one of your own, well, you can, I guess. July 01, 2007- The STC Plasma Tower pages are complete! This impressive piece even lights up. Make one today! June 25, 2007- Hey kids! 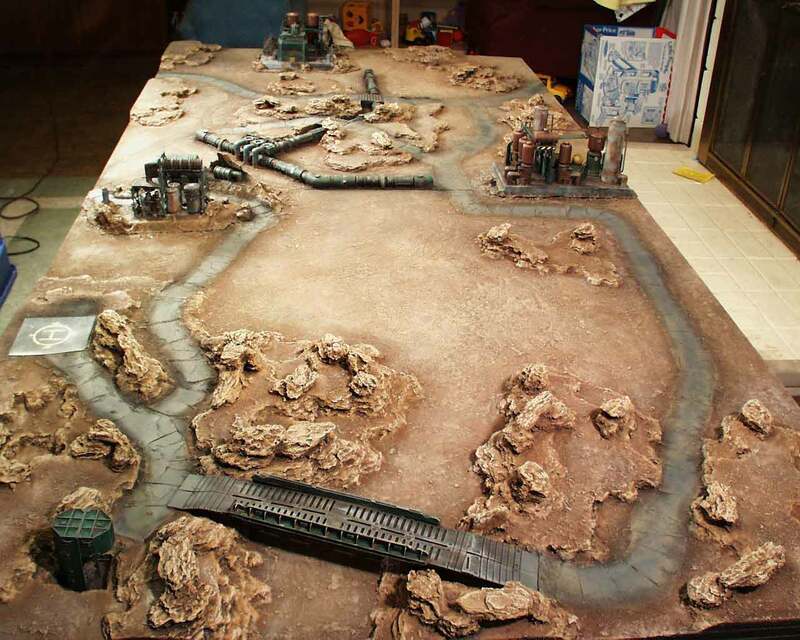 Remember Armorcast, makers of fine resin terrain? Well, a new owner is bringing the old products you love back into production. Check it out at- where else- Armorcast.com. June 13, 2007- YOINK! You were expecting that Reactor STC article, but ha ha! I've pulled a completely different STC article out of the ether! For your viewing pleasure, please visit the STC Ventilator and bask in its greebly goodness. 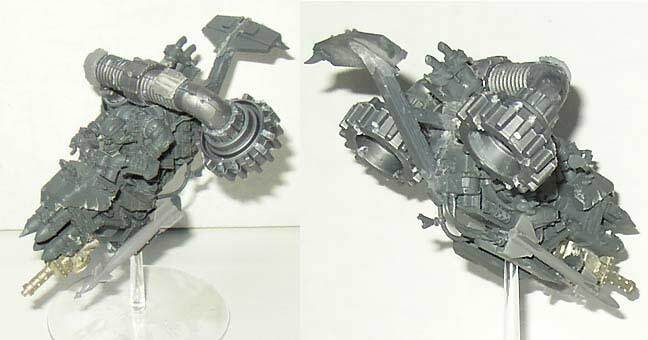 And don't despair, the STC Plasma Tower article is coming soon... right after I demo its construction at the local GW shop later this month. Zing! April 22, 2007- It's been a busy blah blah blah, anyway, here's a couple sneak peeks at the next STC article terrain piece, replete with blinky lightedness. Drop me a line and demand to see the article soon. December 10, 2006- As promised, here's the second STC article, a tidy little gothic Generator . December 04, 2006- Just noticed that Mega Miniatures has picked up most of the Armorcast line- Armorcast terrain fans rejoice! Read more about it here. Also, don't despair, the second STC article is in the works, hopefully should be up by the end of the year. September 06, 2006- OMG! !111 The first STC article is here! 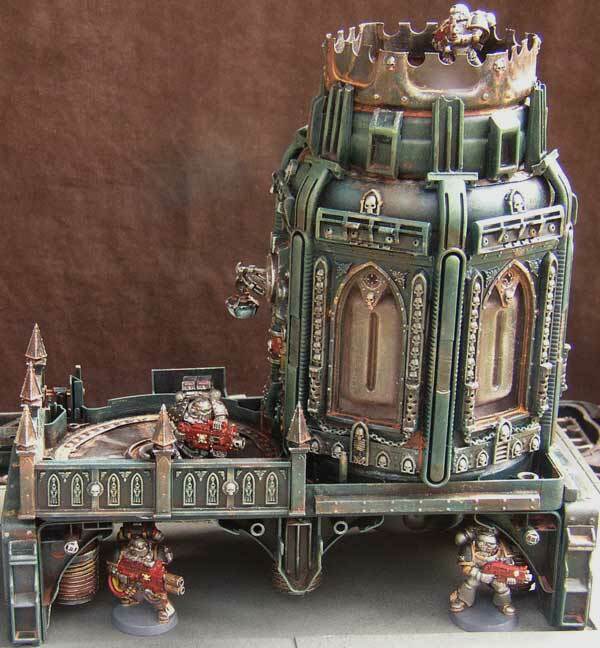 This gothic water tower piece comes complete with detailed instructions, and was featured in a terrain seminar at a local GW. Look for more STC articles to come (sleep deprivation permitting). July 24, 2006- Finally, for your viewing pleasure, here's the Thermal Core. You can see this piece in person at the Seattle GW Battle Bunker. I also did a terrain seminar at another local GW store that turned out well- hope to see you at the next one! 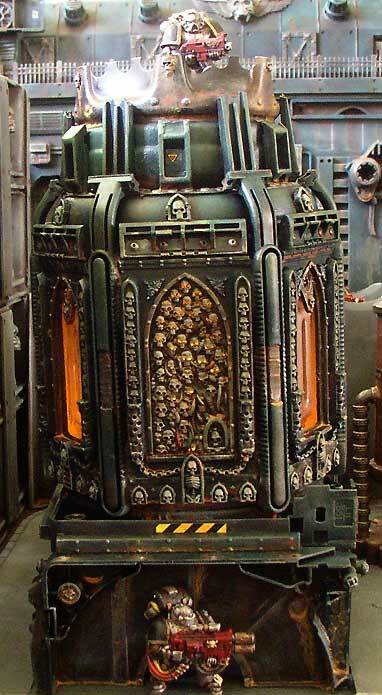 And coming soon, two do-it-yourself articles that tell you step by step how to make some attractive Industrial Gothic terrain pieces, making use of common materials and the new GW Cities of Death building sprues. You won't want to miss it... Oh yeah, I also updated these two images on the Thunderhawk page. June 06, 2006- Well, there you have it. Necromundicon now lives in the Seattle area. I suppose I should start polling for new players. I've paid several friendly visits to the GW Battle Bunker, and picked up the new Cities of Death. The new buildings are gorgeous- I plan to do product review pages that include the new buildings. Look for detailed coverage in a week or so, but for now, here's a quick project I'm throwing together using the new sprues and various other bits. April 24, 2006- In the grand machine of the Omnissiah, every cog is a moving part. And so, Necromundicon's physical manifestation will be moving to the Northwest next month. 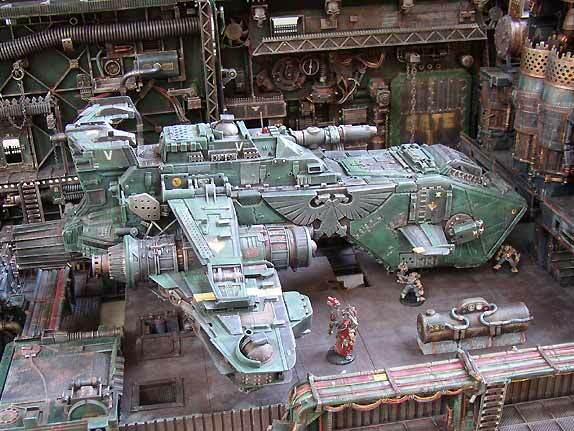 Wish the models a safe journey, and they will reestablish contact with the Imperium once safely out of the warp! March 13, 2006- Finally finished the latest Limited Edition scenery project, a blue-grey Silo tower complex that's about 3x bigger than the Reactor Terrain piece and has plenty of cover up top for your defenders. Pester me if you want one. February 23, 2006- PUBLISHED again! 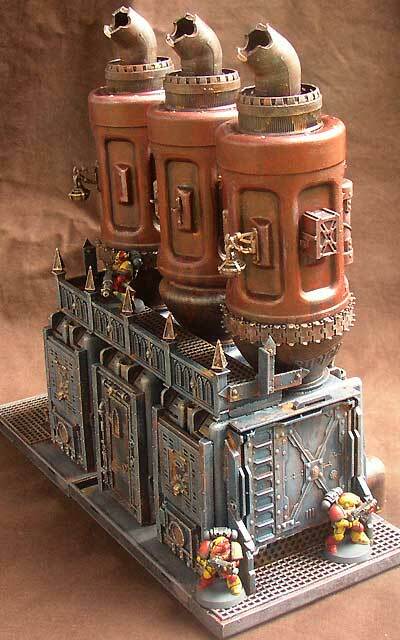 I don't even have my copy yet, but apparently White Dwarf has published my Cooling Tower industrial terrain article! This article was my initial submission, so it's great to see it make it to print. Pick up your copy of White Dwarf 314 today! February 21, 2006- I'm selling some Necromunda Ganger minis (Goliaths, Van Saar, and Cawdor) on EBAY. Please visit and bid, these models need a good home! 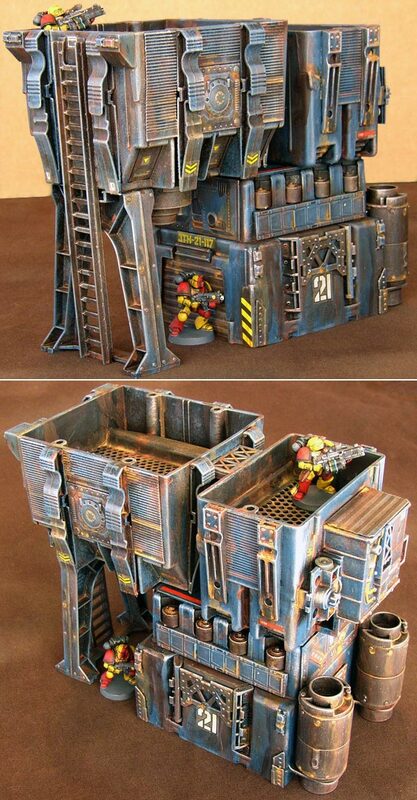 I also still have 1 Reactor Terrain piece available for purchase, contact me for details. January 31, 2006- Hey, everyone! 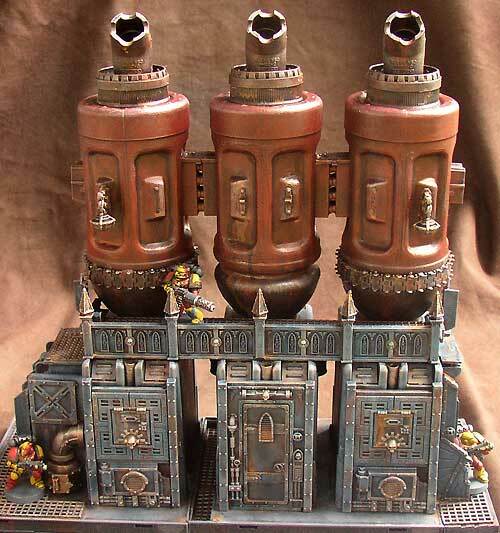 I am SELLING a limited edition Reactor Terrain piece on EBAY right now! Yep, now's your chance to buy an original Necromundicon terrain piece! Please visit the CMON page and drum up some traffic, thanks! I made four of these babies, so if you miss out on the first one, don't fret. Comments and questions welcome. January 26, 2006- Finally (seems to be a trend here) posted pics of my gangers, which I've had for EVER. January 17, 2006- Finally added pics of my Jungle terrain, which has been done for years (well, the foam cliffs are a nice update). November 02, 2005- Added a page for my new Platforms, which increase playable area AND feature chez gothic styling... Also added a couple more pics of Industrial layouts to the Industry Page. September 22, 2005- PUBLISHED! Pick up the October issue of White Dwarf magazine (#309), and on P. 86 you'll find an Eldar terrain article by yours truly! September 18, 2005- I'm a DAD again! Charlotte Nancy Patten has joined our family thanks to the heroic efforts of Mrs. Patten. Hooray, more players for our games! Well, in a decade or so anyway... Expect updates to be somewhat sleep deprived for the next few months. August 16, 2005- Hey, two new pages of rugged Badlands terrain goodness for your perusal. This is the new look for my desert terrain, and recent battles with mutie raiders have proven it to be a fearsome environment indeed! June and July, 2005- Sorry, been busy with potential articles for a certain magazine... look for them many months from now. May 27, 2005- IT'S THE END OF AN ERA... Armorcast is discontinuing their terrain! Place your orders NOW- last day to order is June 30th. Be sure to pick up some overhead pipelines, you won't regret it. May 12, 2005- Updated my Shopping List page with better links, a source for SKULLS, and some other info rattling around in my head. Look for some new industrial terrain by the end of the month- I have some terrain demo pieces in the works... aw heck, here's a sneak peek. March-April 2005- Repainted the gaming table and Gorka Morka bases for Badlands style desert terrain. Still need to get some pics, but they will come eventually, honest! February 07, 2005- Added some info about using Woodland Scenics Instant Water. 4 out of 5 dioramists recommend it! February 02, 2005- Mutants, mutants, everywhere! Aaagh! Fear the mutant! Cleanse and burn! February 01, 2005- Platformer? Hexagon? What do these have to do with wargaming terrain? As it turns out, A LOT. Check this out if you ever had any interest in urban / industrial terrain. GO NOW! Extra special thanks to Robert Calfee for bringing them to my attention. January 03, 2005- Happy new Y....oh, kinda late for that. Work is a killer this month, but the Space Marine (and Sororitas and Mechanicus) campaign will continue in due course. We've been blasting apart endless waves of mutants, big and small (I really will be posting pictures of them soon, really!). December 04, 2004- Finally, a page for the Incinerator! An entertaining piece of flicker bulb Imperial terrain I built over a YEAR ago (we're finally playing regular games with it now). Also included are some light-up lamp posts that came out rather nicely. 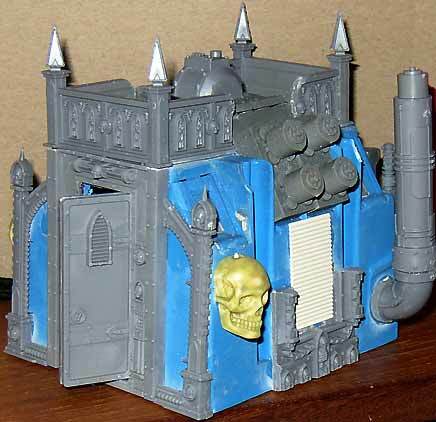 Though thematically appropriate for Industrial terrain, the Incinerator came out so wonderfully Gothic that it ended up in that (much neglected prior) section. October 30, 2004- Necromundicon finally gets a face lift! Well, the main page anyway. Don't expect a site-wide overhaul or anything... Waste of time better used adding more pics, I say. October 06, 2004- I like to play background music during games, and one of my favorites is a band called Xorcist. Check out the site- there's lots of downloadable tunes in the Releases section. (At least check out "Insecticide" on the Insects and Angels album and "Spider" on the Nomad album). Be sure to donate if you download- most of these albums are out of print, so give back to the artist directly! Trust me, this stuff will scare the hell out of your players. July 15, 2004- Added a new pic to the Mordheim city page, and added a Water Wheel to the Rivers page. Also added a bit more info on the foam used for my Snow Terrain. June 12, 2004- FINALLY added a page explaining all those Platforms and Foundations that have been lurking under my Mordheim terrain. Be sure to check it out! May 09, 2004- Argh! Broke away from work long enough to add something. Here's a pic of my Tzeentch Doomwing conversion I've had kicking around since last year (you can find a link on the Tzeentch minis page). Should be back in full swing in a month or so once work calms down. Look for an article on Mordheim foundations, and eventually, some Canyon and Mine scenery perfect for Wyrdstone hunters (or Skrap Diggerz for that matter). December 19, 2003- In the spirit of the season, Snow descends on the city of Mordheim! December 15, 2003- Added Spooky Trees to the Mordheim Extras pages. December 08, 2003- Updated the Mordheim Minis with two new warbands- Elves and Dark Carnival. GRATUITOUS PLUG- DETAILHOSTING.COM. is performing quite nicely for Ironhands.com, thank you! Try them out if you like a good mix of speed, room, cost and customer service. October 15, 2003- Added a whole page on making Mordheim terrain out of those porcelain Christmas Village buildings... Also, check out the updated Mordheim Buildings page for shots of the new Chapel. August 01, 1993- MOVE IS COMPLETE- Physically, I mean. Necromundicon is still here at Ironhands.com, and all is well (only a couple broken models). Pics of new terrain (Incinerator) and an upgraded Armorcast Warhound Titan should be arriving on Necromundicon in a couple weeks (once I unpack the D-Cam... Which box was that in again?). April 10, 2003- Thanks to the demands of our current Chaos campaign, there are now new minis in ALL the Chaos minis pages. I also whipped out a new suppression sergeant model for the Arbites (gotta hold off those Chaos forces somehow...). Pics of my new terrain should be coming soon. March 24, 2003- Been busy with work, family, and a not-so-little Mage Knight display table! Not to mention new scenery and minis for our Chaos campaign (pics coming soon). January 2003- Necromundicon has moved to it's new home at IRONHANDS.COM! Hooray! November 03, 2002- With our Chaos campaign underway, the first new Chaos terrain has come to light! September 27, 2002- Updated the Thunderhawk page with a better pic, a seperate how-to page, and links to other cool Thunderhawks! August 30, 2002- Added massive coverage of the Mechwarrior Table, including 4 pages of How-To, in the new Special Projects area! May 16, 2002- How to make decent Eldar terrain! Also included in the Alien Terrain section are some nice examples of these new techniques put to use in 3 new pieces of Eldar Terrain. March 24, 2002- Added a few more minis to the Mordheim section, including more Amazons , Chaos Dwarfs and Dark Elves, and a seperate section for Sisters of Sigmar. March 20, 2002- Added the Bone Fortress to the Chaos section- the final piece of terrain from our Mordheim campaign. March 05, 2002- Stayed up way too late reorganizing and creating the HOW TO PAGES, including my top 10 tools and materials list. January 07, 2002- Added a couple more models from our Mordheim campaign, splitting the Misc category into seperate pages for Goblins and Skaven. January 04, 2002- Happy new year! The Gothic section now has a subsection for all the MORDHEIM terrain, including new buildings, river sections, and more! December 06, 2001- added some pics of the incredible new terrain and effects made for Mordheim! Even more terrain coming soon. December 03, 2001- added minis and the all-new Mordheim Miniatures section! November 05, 2001- added some pics of my Necron terrain to the Gorka section, including a recently completed Warp Gate. October 10, 2001- added some Demolished Buildings to the Mordheim section of Gothic Scenery. October 09, 2001- added some new Mordheim miniatures, scattered all over the site: Sisters of Sigmar, a Skaven Assassin, and some Amazons. 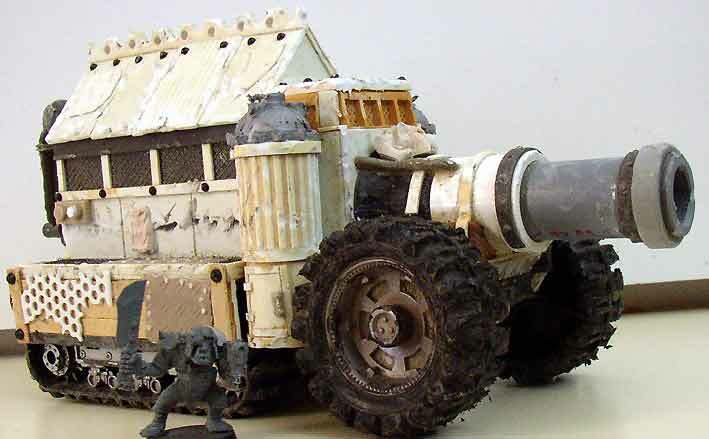 September 13, 2001- Added two new pieces to the new Khorne Vehicles page. August 17, 2001- Added loads of pics of TRENCH scenery, plus a how-to section on making trenches. Also added templates to the Thunderhawk page. August 03, 2001- Added a new pic of the Firebase I had lying around, taken during our Ice World games. July 19, 2001- added three new Slaaneshi models to the Chaos 2 page. July 16, 2001- Added the celebrated Iron Hands DREADNOUGHT to the Iron Hands page! July 05, 2001- Minor updates to the Howling Griffons and Chaos 1 Miniatures pages. July 03, 2001- Added two new pieces of Industrial terrain: the second GENERATOR and some SPACE HULK terrain. 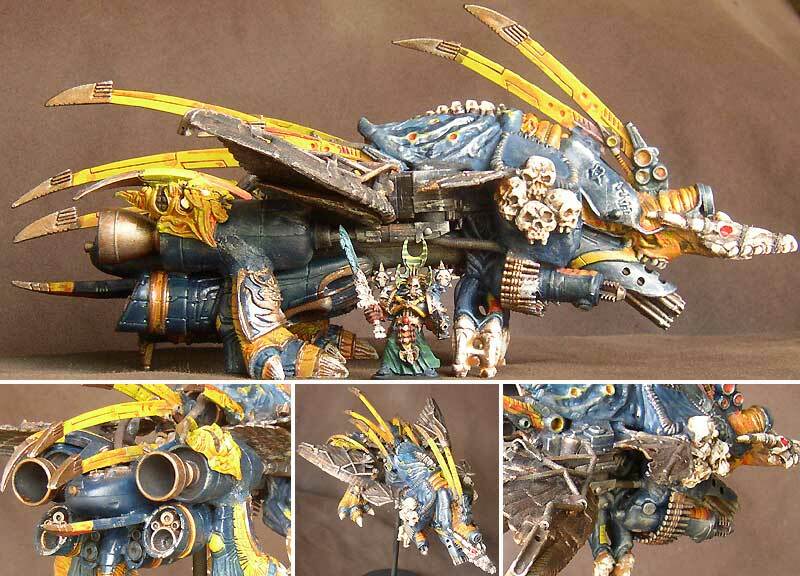 Also, added some big pieces to the Tyranids page (at the top). June 20, 2001- Major update to the Tyranid miniatures page- or should I say, pages! May 31, 2001- Added new Marines to the Iron Hands, Dark Angels, Ultramarines, Black Templars, Howling Griffons, and Mentors pages. March 10, 2001- IT IS DONE. FINISHED AT LAST. DON'T MISS--- THE THUNDERHAWK DROP SHIP. February 22, 2001- Added more minis to the Howling Griffons, Tech Priests, Necrons, Mentors, and Space Wolves pages. Also, check out the sneak preview of my scratch built Thunderhawk- final pics and ranting coming soon! December 07, 2000- Added a whole 'nother page of ORK MADNESS to the Orks section... Waagh! December. 01, 2000- Added Howling Griffons to the marines section. November 10, 2000- Added Black Templars to the marines section. November 09, 2000- Added Orks to the miniatures section! Added more marines to the marines section (Marneus Calgar and another medic). August 18, 2000- Added Space Wolves, Blood Angels(and medics), and more Raven Guard to the Space Marines section of the miniatures. July 17, 2000- Added a whole new section for Space Marines miniatures! June 30, 2000- Added the Fabs building to the Gothic section (nice Necromunda terrain, btw). June 15, 2000- PUBLISHED AGAIN! This time in the venerable Citadel Journal. Necromundicon is featured in CITADEL JOURNAL #38, from Fanatic Press. 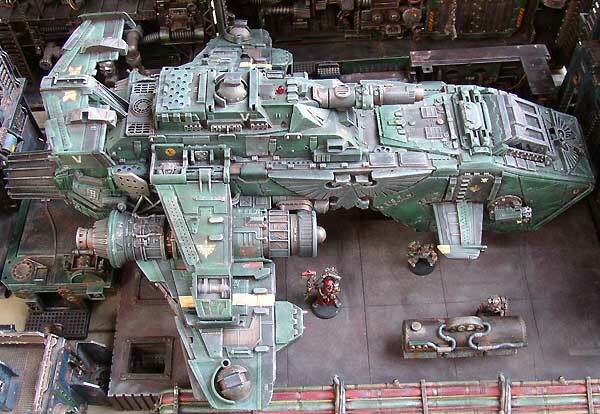 The article covers chaos scenery. Pick it up at your nearest GW retailer soon! May 05, 2000- Finally scanned in some of the models we've been using for our Mordhiem campaign. Check out the Mordheim Villains and Witch Hunters pages added to the miniatures section. March 21, 2000- PUBLISHED! Necromundicon is featured in GANG WAR #5, from fanatic press. Keep your eyes peeled for it, especially if you play Necromunda. March 03, 2000- Added Docks to Gothic section. January 28, 2000- Added a buncha new Chaos miniatures to the miniatures section, including some reorganization of the Chaos minis into groups. December 10, 1999- Added a bunch of new Chaos scenery- check out the Keep! Also, look for more pictures in the Nurgle and Black Tower sections, and the Chaos 2 page in the miniatures section. December 09, 1999- Despite being swamped by work, added shots of Rough Riders to the miniatures section. September 08, 1999- Added Imperial Outpost pictures to the Gorka Morka section. Added two closeup shots to the Bulkheads in the Industrial section. September 01, 1999- Updated the links (check out the new GW gateway! ), added new images to the Chaos Miniatures and Scenery sections. August 23, 1999- Added Beasts, Necrons, and shots of the Tech Priest Rhino in the miniatures section. May 1, 1999- Added the Fuel Processing Plant to the Industrial section. April 23, 1999- Added Tyranids to the miniaturessection. February 25, 1999- Added Squat Trike to the Squat miniatures section. February 10, 1999- Added new conversions to the middle of the Arbites and bottom of the Tech miniatures sections. January 13, 1999- Added a TON of new miniatures, including some new ones in Chaos 2. January 12, 1999- Just did some tidying, including adding a link for Hive Constructors. December 21, 1998- Added two new pieces to the Industrial section- BIG ones! September 18, 1998- Added the ALL NEW Miniatures section, featuring some of my elaborate conversions. September 8, 1998- Added another piece to the Chaos section. Will this madness ever end!? 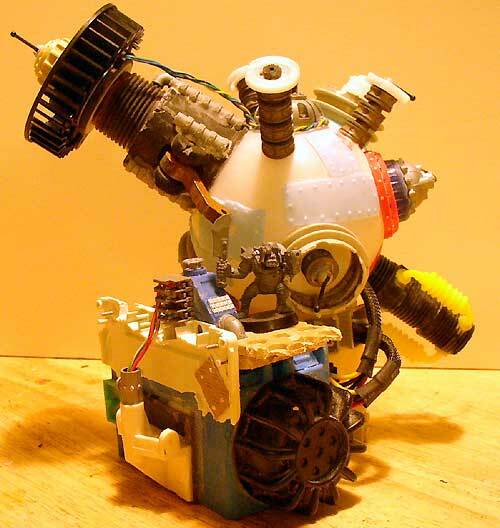 July 24, 1998- Added several new items to the Chaos section, including my most elaborate piece yet! July 6, 1998- Added more info to the Detailand Shopping List sections, thanks to a discovery involving Sculpey! May 15, 1998- Added the What's new section! I've put lots of new pics in the Chaos section. May 08, 1998- Divided the site into four sections, added some new pics to Gorka and Chaos. PRE HISTORY- Necromundicon was originally on dnai.com, then moved to xoom.com, which became nbci.com, which BLOWS, so is now on a new URL back at good 'ol dnai.com! DAWN OF TIME- Necromundicon has previously spent time on ISP.net, though it's not there any more.